The reviews for Rogue One are in, and they’re near-universally positive—including our own. Less the broad caper of The Force Awakens and more a ground-level exploration of some known Star Wars landmarks, the film delivers a careful balance of freshness and nostalgia—but I don’t believe it’s flawless. The original trilogy was about heroic rebels trying to topple the (objectively) evil Empire. The good-est good guy is basically a monk; the baddest bad dude murders a bunch of people and has a face like a sun-deprived raisin. Cut and dry. 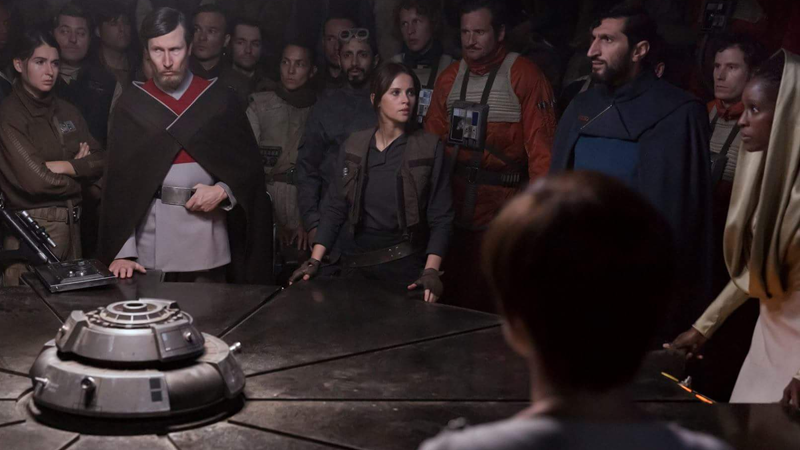 In Rogue One, the Lawful Good Rebel Alliance of A New Hope is shown to have made some morally dubious choices in order to try to free the galaxy from the Emperor. But did they need to be such jerks? Jyn Erso begins her heroic journey only after the Rebels kidnap, interrogate, and strong-arm her into helping them find her father. She’s eventually joined by Captain Cassian Andor, a man whose first scene involves the coldblooded murder of a hapless informant, the latest in a long line of immoral acts on behalf of the Rebellion. Then a high-ranking Rebel officer orders him to assassinate Jyn’s father Galen, even though the complete destruction of Jedha City is all the proof they need that Galen’s work is done and the Death Star is up and running—killing him will achieve nothing. Why? More gallingly, when Jyn and Cassian tell the Alliance about the dangers of the Death Star, and that they need to stage an assault on Scarif, the Rebels decide to sit this battle out, at least in part because Jyn is a “criminal.” (Hey, guys—you’re part of an armed revolt. Pot meet space kettle.) It’s not until Jyn and a few other Rebels rebel against the Rebellion (cough) and attack Scarif on their own that the rest of the Alliance is guilted into joining in. But that doesn’t change the fact that the heroic faction of the original trilogy are too worried about their own necks to even try to save the galaxy at first. Narratively, what’s the point? The big battle scene happens anyway. If the Rebels had agreed to attack Scarif, Jyn’s crew could still have staged the exact same secret mission. The only thing that would have been lost is the gnawing feeling that the Rebellion aren’t particularly righteous or capable. But Rogue One was created to give us a “gritty” look at the Star Wars universe, which means showing the Rebel Alliance has a dark side, and the war against the Empire had some brutal costs for the “regular” people fighting it (i.e., the people who aren’t larger-than-life heroes like Luke, Leia, and Han). Jyn is forced to watch her father and her adoptive father get killed in the span of an hour. Two full cities of people are annihilated by the Death Star’s laser. Before being evaporated by said laser, Jedha City is the target of bomb-wielding terrorists. And, of course, we’re forced to watch the entire Rogue One team die, one by one. Sure, the Star Wars movies have never been strangers to killing characters, but Rogue One’s dedication to watching its characters die is relentless, and usually to no great advancement of the plot. Donnie Yen’s character is a blind badass who believes in the Force; he dies flipping a single switch. Defector and erstwhile Imperial pilot Bodhi Rook is blown up while plugging in some kind of data cable. Baze Malbus employs a laser chaingun and backpack full of space bullets to kill about five Stormtrooper mooks before buying the farm on Scarif. Most egregious is the death of Saw Gerrera, who allows himself to be vaporized for no good reason. Contrastingly, the motivations of the film’s main antagonist, Orson Krennic, are perfectly clear. He’s a petty bureaucrat, navigating a bloated and corrupt system to get ahead for his own ego. Simple, effective, and far less convoluted than Jyn’s reasons for joining the Alliance. The fact that no one from Rogue One appears in any later film always implied from the outset that we’re in for a suicide mission taken up by brave but expendable spies to assist a worthy cause. By undermining the moral certitude of the Rebellion’s and dispatching those soldier so wastefully, I wonder if the particulars of this mission weren’t best left to the imagination.